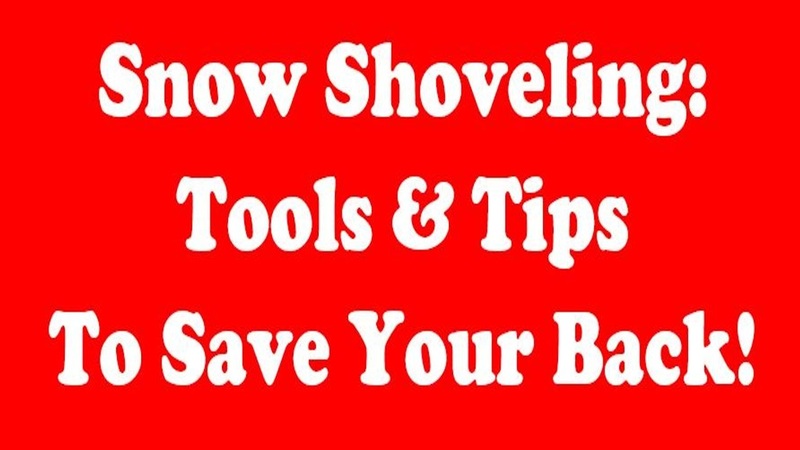 Snow Shoveling: Tools & Tips To Save Your Back! Shoveling is hard enough. Don’t compound the drudgery with the wrong shovel and bad shoveling techniques, both of which can put a serious strain on your back and even your heart. When buying a new snow shovel, common sense says that the larger the shovel scoop, the quicker the work. But that doesn’t mean you should automatically shop for the biggest bucket. Snow, particularly wet snow, is heavy, and the bigger the scoop, the more strain you’ll put on your neck, shoulders, and back. Keep the dimensions moderate. A good size for most situations is 18 to 22 inches wide. High-strength plastic shovels are strong, lightweight, and easy to use. Because they’re less prone to freezing, they release snow better than metal shovels. However, constant scraping against concrete walks and driveways can wear out the leading edge in a single season, and they’re not good for removing ice. Steel shovels are hard to beat for durability — they’ll outlast all others. But they’re the heaviest models out there, and require more energy to use. They’re also the most expensive. Steel shovels are useful for removing both snow and ice. Aluminum snow shovels are more durable than plastic, and lighter and less expensive than steel. However, aluminum may bend when it comes in contact with a stubborn ice chunk or a crack in a driveway. Once bent, they’re difficult to repair. It doesn’t matter how strong a shovel blade is if the shaft twists, turns, and bows while you’re trying to use it. Look for shovels with a sturdy steel, aluminum, or wooden handles. With their high strength-to-weight ratio, fiberglass and resin handles are the premium choice, although you’ll pay up to 20% more than other types of handles. Prices for snow shovels range from as low as $15 for a flimsy plastic model on up to $125 for a solid steel shovel with wooden or fiberglass shaft. Most good-quality shovels, however, fall in the $30 to $50 range. The snow shovels with the funny-looking Z-shaped shafts are billed as “ergonomic.” They’re designed to ease the strain on your lower back by reducing the amount of bending you’ll do while scooping snow. Prices for well-built ergonomic shovels range from $25 to $75. Another version includes a large wheel attached to the handle. The wheel supports all the weight of the snow and acts as a fulcrum for lifting snow and helping you move it out of the way. You’ll pay $130. When it comes to physical exertion, it’s always better to push the snow rather than lift it. Push-type snow shovels or plows are great for driveways and walks where you can simply shove the snow off to the side. Because snow pushers are large in size — anywhere from 24 to 36 inches wide — they aren’t great for when the snow is deep or has to be thrown over a snow bank. Make sure the width of the snow pusher isn’t wider than your narrowest walkways. Snow pushers and plows usually have large, U-shaped handles. Expect to pay $25 for a plastic 24-inch plow and up to $80 for 30-inch heavy-duty aluminum models. It isn’t just a myth that many people get injured from the simple act of shoveling snow. In fact, according to a study by the Center for Injury Research and Policy, there are more than 11,000 medical emergencies each year related to shoveling snow. The study found that just two minutes of shoveling snow can stress your cardiovascular system and raise heart rates past recommended levels. Singled out for blame: the non-ergonomic design of many snow shovels. Alternatives include safely using a snow blower or hiring a snow-removal contractor. When doing the latter, the Better Business Bureau recommends that you get multiple estimates, understand the difference between per-season and per-incident pricing, discuss what’s included (shoveling the front walk? ), request references, and get it all in writing.